The latest publication from Tim Bost in his ongoing series of monographs on Solar Eclipses sets a new standard for astro-forecasting! 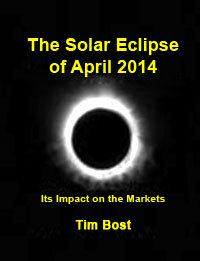 This hard-hitting special research report from Tim Bost reveals all the key information you need on the dramatic effects of the solar eclipse of April 29, 2014. Once again, Tim's world-famous wisdom in financial astrology brings you unique insights that you simply won't find anywhere else. With the incredible information you'll find in these pages, you'll be ready to turn tomorrow's market moves into profitable opportunities! This new publication takes a step beyond the previous reports in this widely-acclaimed series, with a special section on the global geopolitical impact of the solar eclipse contributed by expert mundane astrologer Jim Cummins. Jim's expertise has proven to be a valuable resource for members at the FinancialCyclesWeekly.com website, and in these pages he drills into the national charts and personal horoscopes of world leaders that will be in the news in the months to come, because of the big impact of this stunning solar eclipse. The solar eclipse on April 29, 2014 is much more than a one-day event. It sets up a resonant field that has an enduring impact on geopolitics, economic trends, and price movements in stocks, commodities, and the financial markets. Get this brand new ebook to survive the market mayhem! The markets are heading for a time of major stress, but when you're armed with this information you'll be able to set your own course with the astro-trading advantage! Billionaire Warren Buffett is world famous as a buy-and-hold investor, and a look at his portfolio reveals the essence of his stock picking strategy. Or does it? This insightful e-book reveals the strategy that Buffett isn't talking about - and the details you won't find in any government report!